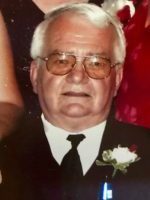 Ken passed away Tuesday, September 11, 2018 at his home in Otsego. He was born August 7, 1944 in Hammond, Indiana the son of Russell and Helen (Paswinski) Kessler. Ken moved to the area in 1990 and for many years he had worked for Wise International. He loved to tinker and liked making things for his grandchildren. He also enjoyed working on cars and tractors and restoring refrigerators. On November 27, 1976 in Hessville, Indiana he married Nada Osting who passed away in May 2017. Surviving are his daughter Kristine Adams of Florida and step-son, Scott (Christina) Doelling of Ohio; 5 grandchildren; 3 great-grandchildren and sister, Ruth Chovanec of Indiana. He was preceded in death by his wife and daughter, Kimberly Wilson. Friends may visit with Ken’s family starting at 5:00 P.M., Friday, September 14, 2018 at the Winkel Funeral Home, Otsego until the time of the funeral service at 6:00 P.M., with Pastor Barry Lucas officiating. Contributions in memory of Ken may be made to Wings of Hope Hospice of Allegan. I’m sorry to hear of your Dad’s passing, may the Lord comfort you at this time, I was oneof the caregivers who cared for your dad breifly when he was at home for a short while. He was fun to get to know, and always seemed to tell us you don’t have to work hard here just relax and talk to me. Thank you for allowing us to help him temporarily. I worked with your dad at the International dealer. I have fond memories of him. I’m so sorry for your loss. This is a difficult time for all of us that knew Ken and loved him. I know that he was a wonderful husband, father, uncle, brother, son, grandpa, and especially close friend. He will be missed dearly. I’ll never forget this great human being and one of the three amigo’s. Love you buddy Rest in peace. We had a great time years back working at DON LUCAS IMPORTS in Marquette have many great memorys. sure missed he and Nada when they moved to the lower. God bless and keep Ken and Nada. Hey Old Friend, Neighbor, Classmate …I guess Heaven needed a Linebacker to play on the Morton Governors Roster of those who have gone before us. Coach Zlotnick will be Happy to see You !! AMEN BROTHER !! Im sorry to hear of your passing, I was hoping to meet you this summer, in my pollution investigation work on Hill Road. I believe mill surface runoff may have made its way into your neighbor. I will in your honor never stop looking for the cause of your illness sir.